I woke up this morning and I'm sitting here utterly speechless and with tears of joy!! Everyone's generosity is very heart warming and wonderful!! Thank you so much for contributing to the campaign. I know the badge says I've Raised $49537 from 745 Donations! It really should say "We" There was lots of help from the Sharing Foundation family - board members, volunteers, and supporters -- especially TSF's founder, Dr. Hendrie, whose relentess attention to campaign made it successful. In addition, we received lots of support and help from the Cambodian adoptive parent community and their families, churches, synagogues, fellow employees, golf buddies, quilting clubs, book clubs, parents of their children's school mates, high school and college friends, and beyond. The Cambodian American community also rallied for us too! In addition, I want to thank all the readers of this blog and my colleagues who I hit up for donation to this campaign! You all rock! This money will send over thousand Cambodian youngsters to school in 2007, plus cover a lot of the costs of the Sharing Foundation's educational programs which include a pre-school, khmer literacy program, English language program in the local village schools, vocational training (sewing school) and high school/college sponsorship programs. We now await the results of the Network for Good/Yahoo Challenge. I will be returning to my regular blogging topics! The public must have seen what you try to do is the right thing to help Cambodia. We are lucky to have you and your team working on this project. Your team is one of the best. Thank you for your kind email. As you know, I'm trying my best as a community activist, is not easy. 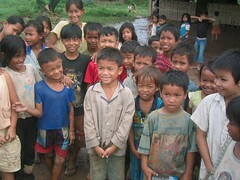 But, doing something to help Cambodian children is one of my main focus. I am seeking the helpers who are the experts in the field of the fundraising havetheir invaluable expertise. I know I have to invest a lot of efforts, resource, and time. But, this is my big efforts to try any which ways I can to help Cambodian people here, in the rest of the world, and in Cambodia. I feel responsible for this duty to help our Cambodian people . Congratulations on doing such an amazing job with this campaign. We've clearly got much to learn from you. I have been tracking the donations via your widget, which I placed on my blog. Absolutely amazing! People have such big hearts. Thank you for sharing such an appealing and simple fund-raising idea to help those in need.